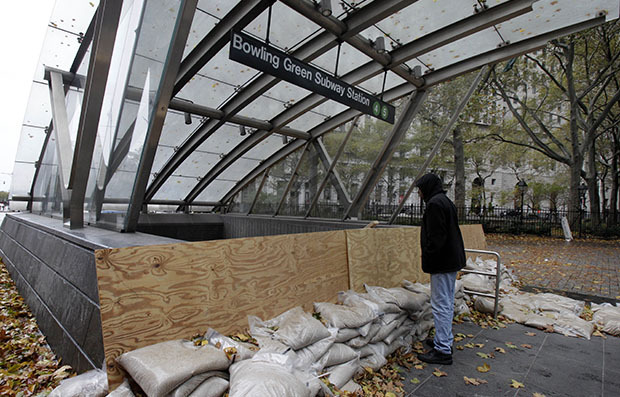 Superstorm Sandy devastated New Jersey, New York, and other areas along the eastern seaboard six months ago on October 29, 2012. It took at least 72 lives in the United States and caused nearly $50 billion in damages. Congress eventually provided $60 billion in disaster relief and recovery aid after weeks of deliberating and partisan bickering. These recovery efforts continue to this day. Sandy was the worst natural disaster in the United States in terms of destruction and deaths since Hurricanes Katrina and Rita in 2005, but it wasn’t the only one. In 2011 and 2012 alone, the United States experienced 25 floods, storms, droughts, heat waves, and wildfires that each caused at least $1 billion in damages. Combined, these extreme weather events were responsible for 1,107 fatalities and up to $188 billion in economic damages. The Center for American Progress conducted an analysis and found that the federal government—which means taxpayers—spent $136 billion total from fiscal year 2011 to fiscal year 2013 on disaster relief. This adds up to an average of nearly $400 per household per year. Nearly all of this disaster spending was for relief and recovery from these and other smaller natural disasters. Most of these disasters are symptomatic of the man-made climate change resulting from massive amounts of carbon emissions and other pollutants in the atmosphere, which warm the oceans and the Earth. As climate change accelerates, so will federal spending on disaster relief and recovery, which will ultimately be paid for by taxpayers. The nearly $400 per household spent annually over the past three years could be the beginning of a very costly future as climate-related extreme weather multiplies. This issue brief explores federal spending on disaster relief and offers up recommendations for how we can respond to the potential growth in these expenditures. Some extreme weather and climate events have increased in recent decades, and there is new and stronger evidence that many of these increases are related to human activities. Human-induced climate change has already increased the frequency and intensity of some extremes. Over the last 50 years, much of the U.S. has seen an increase in prolonged stretches of excessively high temperatures, more heavy downpours, and in some regions more severe droughts. The National Climate Assessment draft also warns that future extreme weather events threaten infrastructure, agriculture production, and public health, among other impacts. It argues that because climate change will lead to more frequent and/or extreme weather events, the damage resulting from these events will also increase. Infrastructure across the U.S. is being adversely affected by phenomena associated with climate change, including sea level rise, storm surge, heavy downpours, and extreme heat. Planning and managing based on the climate of the last century means that tolerances of some infrastructure and species will be exceeded. For example, building codes and landscaping ordinances will likely need to be updated not only for energy efficiency, but also to conserve water supplies, protect against insects that spread disease, reduce susceptibility to heat stress, and improve protection against extreme events. As with past severe natural disasters, the federal government must continue to provide disaster aid for families and businesses severely harmed through no fault of their own by climate-related extreme weather events. Since additional federal recovery assistance is rarely offset by budget cuts or revenue increases, this aid will likely add to the federal budget deficit. This means that the $60 billion appropriated for recovery from Superstorm Sandy could be a harbinger of future federal spending. As destructive climate-related extreme weather events increase in frequency and/or ferocity, government officials and the public should be informed about how much money the federal government spends on disaster relief and recovery. This will enable government officials to more accurately budget for such events, and it will give the public a better grasp on a major cost of climate change that they will have to pay. As part of the Budget Control Act of 2011, the Office of Management and Budget was required to report to Congress on “ disaster relief spending … over the previous 10 years.” It determined that, “The average funding provided for disaster relief over the previous 10 years (excluding the highest and lowest years) is $11.5 billion for fiscal year 2011.” Because the highest and lowest spending levels were excluded in order to derive the average, the $37 billion spent in FY 2005 on recovery from Hurricanes Katrina and Rita, as well as other disasters that year, was not included. This annual average was significantly lower than the $60 billion appropriated for Superstorm Sandy recovery. We believe that OMB’s estimates for 2001 to 2011 did not fully account for all federal disaster spending and that these estimates are less than actual spending because OMB could have omitted some important relief and recovery programs and agencies. The estimates included spending from 26 agencies or programs in 11 federal departments, but our analysis identified a total of 96 agencies or programs in 19 departments that appear to provide some sort of disaster assistance to the American public. 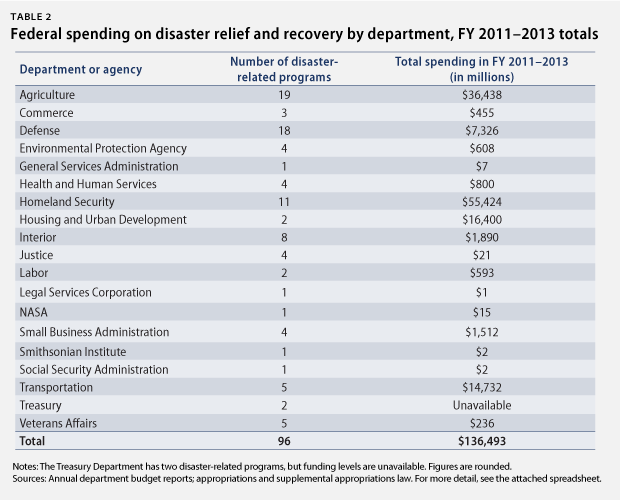 OMB estimated that actual disaster-relief spending in 2011 was $2.5 billion. 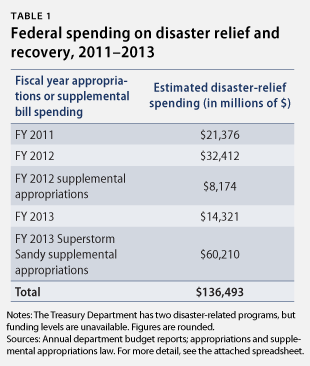 We estimate that the federal government spent $21 billion on disaster relief and recovery in fiscal year 2011. More significantly, our analysis could not identify a more recent comprehensive estimate of federal disaster-relief spending that included fiscal years 2012 and 2013. This is a serious omission given the 25 weather events that each caused $1 billion or more in damages in fiscal years 2011, 2012, and 2013. (FY 2013 includes relief for Superstorm Sandy even though it occurred in calendar year 2012.) In addition to the $60 billion for Sandy, CAP identified another $76 billion in disaster spending since fiscal year 2011, for a three-year total of $136 billion. And this is a conservative estimate because disaster-spending figures for some federal disaster programs were unavailable. Many communities are undertaking efforts to make their buildings, shelters, water treatment, electricity, roads, and other vital infrastructure more resilient to damage from extreme weather. Such efforts are expensive, particularly for cash-strapped communities and states that are still recovering from the Great Recession. But making these investments can help save money in the future, when storms, floods, heat waves, droughts, and wildfires will become more frequent and/or more devastating. The Federal Emergency Management Agency, or FEMA, estimates that “a dollar spent on [pre-disaster] mitigation saves society an average of $4” in lower damages. Tulsa’s floodplain and stormwater program is based on respect for the natural systems. It includes comprehensive watershed management, dedicated funds for maintenance and operation, a prototype alert system, and a $200 million capital improvements program. We’ve stopped creating new problems. Since the City adopted comprehensive drainage regulations 15 years ago, we have no record of flooding in any structure built in accord with those regulations. The city is also partnering with local businesses to develop contingency disaster-recovery plans to help businesses quickly recover and reopen after floods or other extreme weather. It is imperative that the federal government provides technical and financial assistance to the most at-risk communities; such efforts are an excellent economic investment. Because the federal government pays for a major share of disaster recovery, investing in resiliency now will help protect taxpayers from more deficit spending in the future. Develop a comprehensive plan to help local communities prepare for the anticipated impacts of increased climate-related extreme weather. Estimate the financial support necessary for communities to develop and implement plans to increase their resilience to floods, severe storms, droughts, heat waves, sea level rise, wildfires, and day-to-day economic impacts. Identify federal programs that already provide funding for resilience efforts. Recommend a dependable revenue stream to provide additional resources for local pre-disaster mitigation planning. Includes $200 million for “Climate Ready Infrastructure” that build enhanced preparedness to extreme weather and other impacts of climate change in their planning efforts, and that have proposed or are ready to break ground on infrastructure projects to improve resilience. These investments will support a broader Administration commitment to help communities become more resilient through direct technical assistance, provision of useful data and tools on projected impacts, and support for planning. In addition, technical-assistance grants for community-resilience projects are available through the Department of Housing and Urban Development’s Sustainable Communities program. These efforts are an important start, but they provide only a small amount of the revenue that is essential for building more resilient communities across the nation. If this trend continues at the same rate, the United States will experience more frequent and severe extreme weather events in the years to come, meaning that the federal government will have to spend more and more funds on disaster-relief efforts, leaving taxpayers with the bill. There are several policies and actions that the federal government can pursue now to address this situation and prevent it from spiraling out of control. President Obama should require the Office of Management and Budget to conduct an annual—and complete—accounting of funds spent on every disaster-relief and recovery program in the previous fiscal year. This would enable public officials and citizens to better understand the true cost to taxpayers of unchecked extreme weather. The government can create a dedicated source of revenue to help communities develop and implement plans to become more resilient to future floods, storms, droughts, heat waves, and wildfires. CAP endorsed a proposal by former senior FEMA officials to annually provide an average of the three previous years of federal disaster spending for this resilience fund. Rep. Capps and CAP proposed that President Obama appoint a blue-ribbon commission to identify a dedicated revenue source for this resilience fund. The panel members could then advocate that Congress create the fund by levying a very small tax on some or all fossil-fuel production, pollution, or use to reflect some of the external costs of their production and combustion, such as damages from more extreme weather or premature deaths from additional smog. Scientists have recommended limiting carbon pollution to 450 parts per million or less by 2050, saying that this is essential to avoiding the worst impacts of climate change such as extreme weather. Carbon dioxide emissions were at 397 parts per million in March 2013, according to NOAA. In 2009 President Obama pledged to meet a 2020 carbon-pollution-reduction goal of 17 percent below 2005 emissions levels. The Environmental Protection Agency just determined that in 2011 emissions were 7 percent below 2005 levels. To meet the 2020 goal, therefore, President Obama must establish significant pollution reductions from existing power plants, oil refineries, and other major industrial sources. The Government Accountability Office just included “climate change risks” in its biennial assessment of events that pose a risk of significant uncontrolled government spending. Yet we believe that the federal government does not have a comprehensive account of the current costs of extreme weather and other climate change impacts. We are flying blind into a future with more costly disaster-relief and recovery spending. The debate over solutions to the federal budget deficit has dominated Washington since Republicans took control of the House of Representatives in 2011. Nonetheless, these same House leaders continue to ignore the current and potential future explosion in federal spending for disaster recovery due to climate-related extreme weather events. Extreme weather events continue to plague the United States in 2013. Together, the March tornadoes iin Indiana, Kentucky, and Ohio created the first event that caused $1 billion in damages identified by NOAA this year. The drought in the Southwest is expected to continue through another costly year. Recovery from the flooding along the Mississippi River will likely draw on federal relief funds. 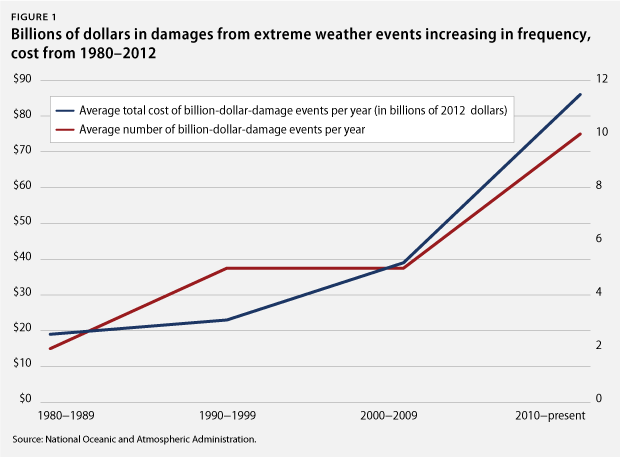 All the while, the cost of extreme weather continues to grow. Sir Francis Bacon long ago observed that “knowledge is power.” Currently, public officials lack complete knowledge about annual federal spending on disaster relief and recovery—a major omission at a time when extreme weather will likely increase in frequency and/or severity due to climate change. Gathering this cost information should strengthen the case for assisting communities with their resilience plans, which will reduce future damages and taxpayer spending for recovery. Knowledge about the household share of disaster spending should empower people to join efforts to attack the harmful effects of climate change. Daniel J. Weiss is a Senior Fellow and Director of Climate Strategy at the Center for American Progress. Jackie Weidman is a Special Assistant on the Energy team at the Center. The authors would like to thank Cathleen Kelly, Senior Fellow, Mari Hernandez, Research Associate, and Mayhah Suri, intern, all at the Center, for their contributions to this analysis. This Center for American Progress analysis compiled natural-disaster-related spending data from multiple sources. We identified the list of federal programs with disaster-relief and recovery functions based on a review of related departments’ annual “budget in brief” reports for FY 2011 through FY 2014. Other disaster programs were included in Congressional Research Service reports and the Catalog of Federal Domestic Assistance. The spending data in the attached spreadsheet for each agency and program identifies the source of the information. We used the “budget authority” or “obligation” figures in nearly all cases since they reflect the amount of revenue Congress set aside to pay for relief and recovery. We also gathered spending data from three supplemental appropriations bills: P.L. 112-77, the Disaster Relief Appropriations Act of 2012; P.L. 113-1; and P.L. 113-2, the Disaster Relief Appropriations Act of 2013. These bills allocated $8.7 billion, $9.7 billion, and $50.7 billion, respectively, for the National Flood Insurance Program and other disaster assistance following Superstorm Sandy and severe flooding in the Midwest. These figures do not include the impact of sequestration on the FY 2013 accounts. For a complete list of programs and funding, please refer to the attached spreadsheet. Inevitably, this compilation of federal disaster spending has gaps, but we believe it includes all the major programs that fund disaster relief and recovery annually. We welcome any documentation for corrections.